A - L: 8:30 a.m. – 11:30 a.m.
M - Z: 12:00 p.m. – 3:30 p.m. Note that for the year, 2016 - 2017, per the schools announcement on the website, the morning timing was 8 - 11:30 AM. This session was for last names beginning with the letters M - Z. The afternoon session was from 12:00 PM - 3:30 PM for last names beginning with the letters A - L. Please follow the instructions mentioned in the communications received from the school. Donot assume that if your last name starts with an "Z" your session will be in the afternoon. The Parent Camp happens at the same time as the Greyhound Camp. The Parent Camp generally takes place in the auditorium and the Greyhound Camp (for students) takes place in the gymnasium. AFTER Parent Camp, PTO will be selling MMS uniform shirts, and the P.E department will be selling P.E. uniforms. Magnet fees may also be requested by the school at this time (in some of the previous years this was $75 per magnet topic). This changes from year to year and may move to add an on-line payment system. If they are to be paid on the day of the camp, please note, Magnet fees are only accepted in CASH. Bring at least $150 if your student is enrolled in 2 magnet topics. They have varied from $60 to $75 based on the magnet area. Please budget for some time to be spent; around 2 hours. There are a lot of children and parents to be attended to, fees collected and uniforms sold, even though the groups are divided over half days. There may also be re-modelling taking place in the old school building, so please be patient and be a role model for your child. Last year, each person was given a number which would get called. This way, you could sit in the stands waiting for your number to get called, instead of standing in line. ​Please plan to join the PTO during that time if you have not joined already. JOINING THE PTO IS FREE. We welcome all our parents to join us and be involved in their children's lives at school. 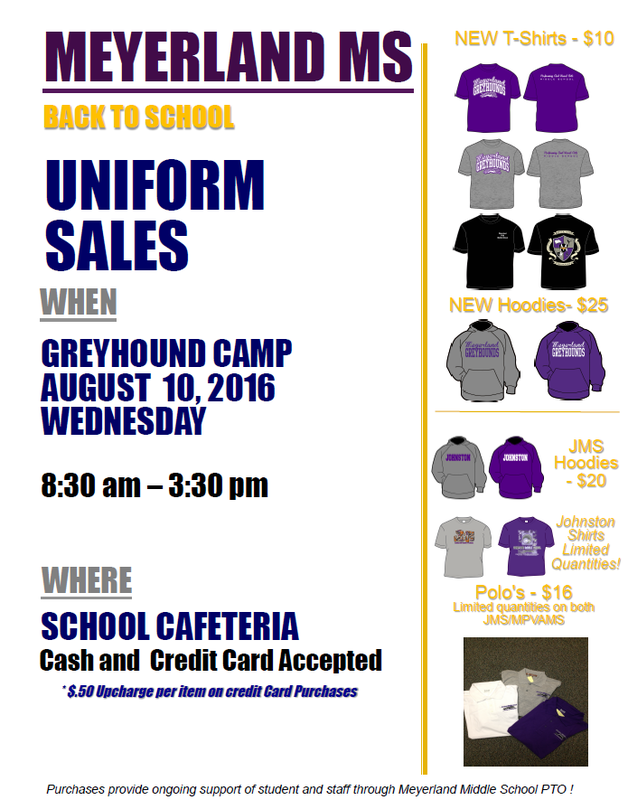 See this year's flyer below as an example of when such uniform sales take place. Prices should be confirmed with the uniform sales representative on-site or from the contact info on the contact list.